This kid wears all blue and walks with a cane; is he one of the Crips? Freddy Freeman was an average young boy until the villain Captain Nazi killed his grandfather and left him crippled. Witnessing the tragic accident, Billy Batson, also known as the hero "Shazam!" shared some of his incredible powers with Freeman, making him a crime-fighting partner. After adventuring with the Teen Titans, a terrible event left Freeman without powers or direction in life. One day, he was magically transported to the Rock of Eternity to go through a series of trials. Upon his success, he finally achieved the incredible powers and the DC Super Hero idenity Shazam! That bio is endearingly out-of-date. It refers to the post-Infinite Crisis stories (primarily The Trials of Shazam) when the wizard Shazam was killed, Billy Batson took his place in the Rock of Eternity, and Freddy Freeman had to become the new adventuring hero. And since Freddy got his powers by saying "Captain Marvel" rather than saying "Shazam," he changed his supranym so he wouldn't revert to a plain, handicapped kid every time he introduced himself (which is the same reason he went by "CM3" in the '90s). Basically, the whole thing was a clumsy attempt to justify changing Captain Marvel's name to Shazam, since that's how the public thinks of him anyway. I'm just surprised they were allowed to put the word "Nazi" on the packaging. Maybe the lawyers were all too busy making sure the name "Marvel" didn't appear anywhere. 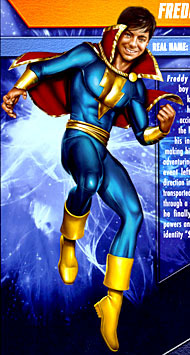 Captain Marvel Junior was the favorite superhero of a young Elvis Presley, who modelled his life after the character - going so far as to dye his blonde hair black and style it with the same small curl on the forehead. With that in mind, it would have been neat if the head looked more "Elvis-y," for lack of a better term. Turn the connection around. 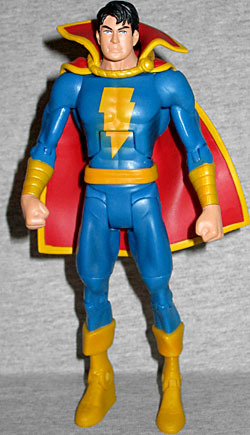 Captain Marvel Jr. uses the DCU Classics "Large Teen" body, making him the same size as Sinestro and Bruce Wayne. At first I even thought he used the Sinestro forearms, since Sinestro had banded bracers and CM3 does as well, but nope, they're a different sculpt. How unexpected! And unnecessary. This is a corner Mattel could have cut, but didn't. His boots are new: they have the folded edges and large stitches of a traditional "Marvel Family" boot, but needed to be small enough to fit on this body (and more masculine than Mary's could manage). He's also got a new sash-style belt, but there are no surprises in the articulation. And then there's the cape. 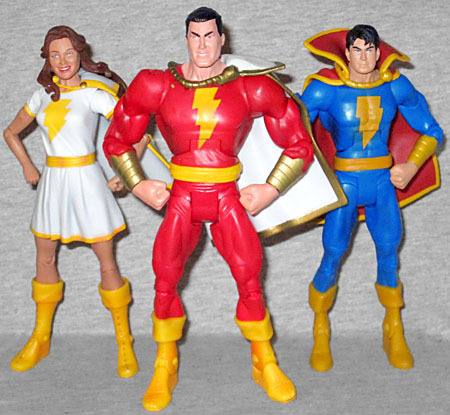 Since Freddy got hand-me-down powers, he didn't get to wear the same uniform as the other two: pre-Crisis, Captain Marvel and Mary Marvel both wore red suits with white capes, while Captain Marvel Jr. wore a blue suit with a red cape, making him look like he really didn't belong; this was fixed post-Crisis by giving Mary a white uniform and Junior a white cape, making them all look related but unique. Junior's cape was another feature Elvis borrowed. With its high collar and short length, it's exactly the sort of thing he wore over his rhinestone-spangled jumpsuits. 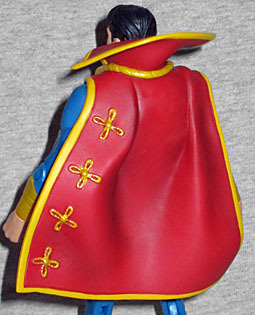 This is the widest, flattest cape any of the Marvel Family figures have been wearing yet, and his collar comes up the highest. Mike Thompson did the digital painting of the character on the back of the packaging. 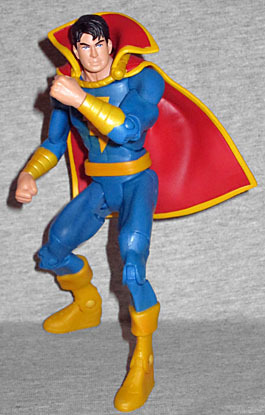 Cap Jr. is shown hovering in mid-air, ready for a fight. The blue used for the body of his costume is more of an aqua shade than the blue of the toy, but the toy's coloring would have blended in with the standard "space" backdrop behind the art (and it's still a nice contrast with the red and gold. His head looks too large for his body, but remember, this is still a kid: while teenage Billy Batson became the adult Captain Marvel, teenage Freddy Freeman stayed the same age when he powered up; so by making the head larger, it makes the person in the painting look younger. The hairstyle back here doesn't have any Elvis in it - no slickness, no pompadour, no curl, nothing. Instead, it's straight and rounded. He's got Bieber hair! By inspiring Elvis Presley's sense of theatricality, Captain Marvel, Jr. has had more influence in real life than he's ever had in the comics. Considering the only previous Junior figure was released by DC Direct in 2007, he was sorely in need of an update. Plus, unless Mattel decides to make a figure of Hoppy the Marvel Bunny, we've finished the whole family! Wait, that's just dumb; there's no way Mattel would be stupid enough to release an action figure of a giant rabbit.